VULTUREMAN invents the Shifter, a device that switches one person’s personality into another’s body. He uses it on PANTHRO’s personality in SNARF’s body. 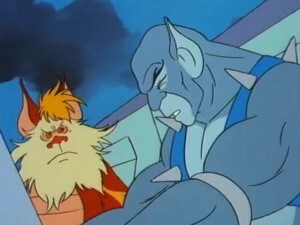 The reverse PANTHRO and SNARF drive the ThunderTank together and locate the other THUNDERCATS. When S-S-SLITHE questions the value of VULTUREMAN’s Shifter, an angry VULTUREMAN switches S-S-SLITHE’s and JACKALMAN’s personalities and bodies. Thus transformed, the MUTANTS set out to attack the Lair. They meet the ThunderTank en route and topple it into a crevasse. SNARF in PANTHRO’s body is trapped beneath it. 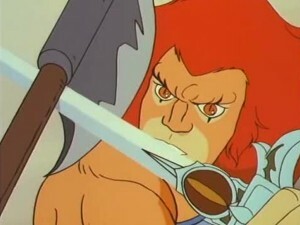 The Sword of Omens alerts LION-0 to the MUTANT attack. He and WILYKAT rescue SNARF in PANTHRO’S body and set off for the Cats’ Lair. VULTUREMAN uses the Shifter on LION-0 and WILYKAT, but together they use the Sword to scramble the Shifter’s rays and return each ThunderCat to his rightful body. Then they bounce the Shifter ray toward the MUTANTS to switch their bodies and personalities. The MUTANTS retreat in confusion. 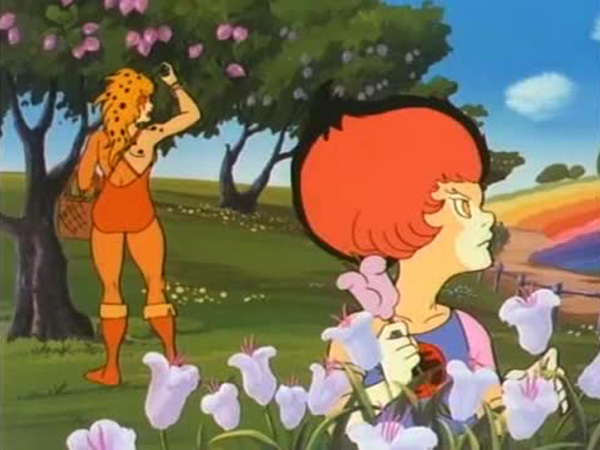 Summoned by the Sword, CHEETARA, TYGRA, and WILYKIT appear belatedly to find everything back to normal. Vultureman invents a Shifter, a weapon that shifts the personalities and bodies of two individuals. He uses it somewhat indiscriminately to enact a series of switches in the ThunderCats and Mutants. The Mutants seize upon the confusion created to attack the Cats’ Lair. In the battle the transformed Mutants and ThunderCats find it hard to adapt to their new bodies. 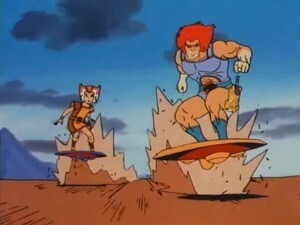 And Vultureman affects another switch by shifting Lion-O and WilyKat. Lion-O in his new body tries to call upon the powers of the Sword of Omens, but finds in his transformed state that it will only respond to both him and WilyKat together. 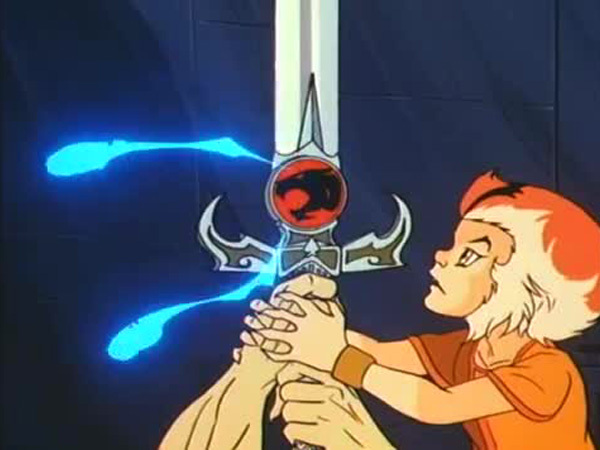 Once in action, however, the Sword rescues the ThunderCats by turning the switching laser gun back on Vultureman and the Mutants. And it reverses the transformations in the ThunderCats, returning them to their normal selves. Persons are made up of both physical attributes, including their body, and of mental, social, and emotional attributes, including their personality. It is the attributes together that make up the person as a whole, and not just one kind of attribute. This episode portrays this fact by showing characters experiencing their personality being switched into another’s body. 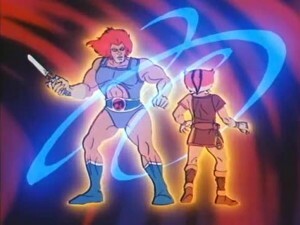 And when Lion-O and WilyKat get switched, it takes both parts of Lion-O, his body and personality, to call on the Sword’s powers. We should consider this whenever we are tempted to envy someone else for a particular characteristic, whether a physical, mental, social, or emotional quality. Each of us has particular characteristics of our own and taken together make us unique. We do not gain anything by concentrating on what we don’t have and trying to be like others. Rather, we do better if we learn more about all of our own unique talents and skills and cultivate them. Then we can be a total person in our own right. Moreover, there is a way in which it is important to be aware of others. That is in being able to take their perspective and feel what it is like to be them. Empathy is that quality. In this episode, the characters who were switched learned a new appreciation for the others’ unique abilities. 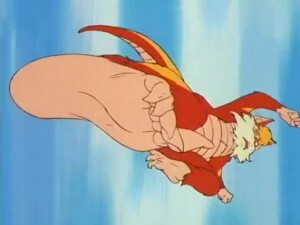 Panthro, for example, learned how Snarf copes with his body and how he is resourceful in using his tail. When we empathize with others, we don’t do so because we dislike ourselves and want to be like them necessarily. Rather, we are sensitive to them so that we can appreciate and understand others. In that way we can both learn from them and respond to them when they are in need. “Freaky Friday” meets the ThunderCats in this thrilling episode! We all wish that for just once our critics would walk a mile in our shoes. And according to writer Matthew Malach, the ThunderCats possess this same desire as well. 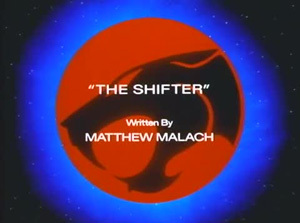 In his debut episode “The Shifter”, Malach creates a story which grants the feline heroes this wish. Beginning with a scene of Panthro and Snarf getting their minds swapped by a strange force, the episode immediately grabs the viewers’ attention and fills them with bewilderment and curiosity. Only later on, is the cause of this quandary revealed. 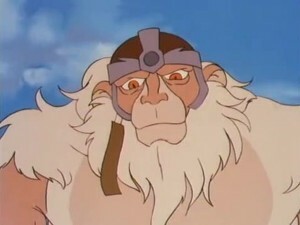 The Mutants’ master inventor Vultureman has designed the Shifter, a device which can shift the consciousness of any two beings into each other, and Panthro and Snarf were his first targets. 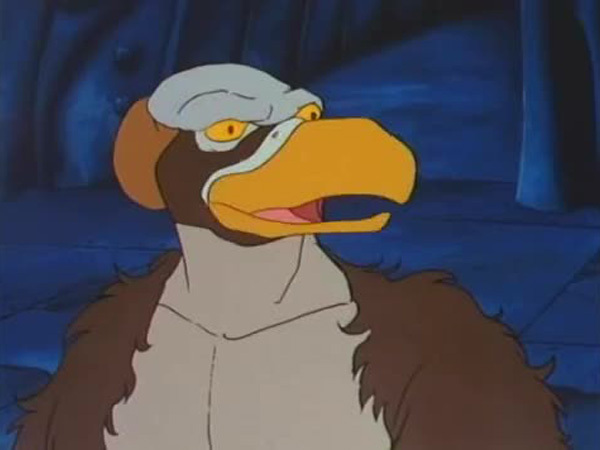 When S-S-Slithe and Jackalman refuse to believe Vultureman, the beaked brainiac uses the Shifter on them. To make matters worse, Vultureman sheepishly confesses that he has yet to figure out a way to reverse the effects of the Shifter. Despite their predicament, the Mutants decide to attack the Cats’ Lair in the Flying Machine while the interchanged Panthro and Snarf struggle to fend them off. The scene of Panthro driving the Thundertank and Snarf acting as a back-seat driver is both hilarious and memorable. When Lion-O discovers Panthro speaking in Snarf’s voice, he initially thinks that the ThunderCat is out of his mind! The identity crisis escalates when the Mutants switch Lion-O and Wilykat’s minds too. The script emphasizes the importance of teamwork as the ThunderCats are forced to rely on each other more than ever. This gives them a whole new perspective and teaches them to appreciate one another. In the hands of a less experienced writer, a script like this could have easily turned into a slapstick comedy and lose its value. But Malach’s skillful writing results in a gripping story. The script is punctuated with funny and witty one-liners which counterbalance the intense situations. 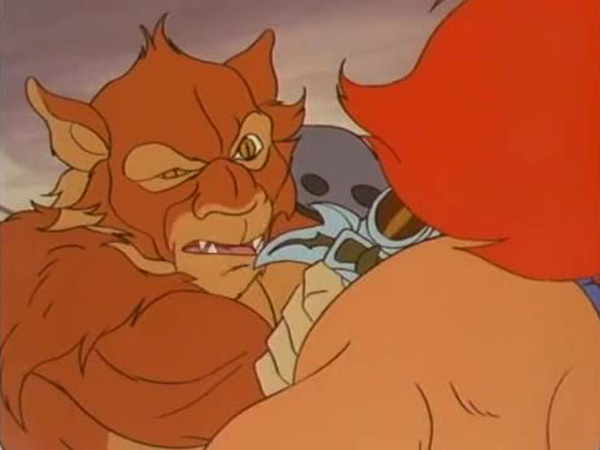 One example is when Panthro, in Snarf’s body, threatens to teach the Mutants a lesson. Vultureman responds with: “You couldn’t teach us to knit!”. The artists at Pacific Animation Corporation (PAC) are at the top of their game here, bringing the story alive with dazzling visuals. Not only are the special effects impressive, but the animators have taken great care to infuse the transformed characters with the traits of their alter egos. This is beautifully showcased in scenes where Snarf displays his martial art skills and Panthro cowers away like a scaredy-cat! The script’s attention to detail is also commendable. Before joining in the action, each of the ThunderCats is doing a specific task and this adds realism to the story instead of having them appear out of oblivion. When the Sword of Omens fails to respond to either of the swapped Lion-O and Wilykat, they both hold the blade and make it work. 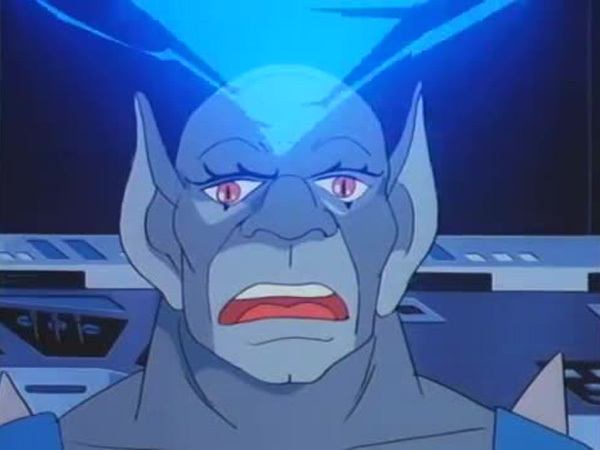 The personality dilemma is repaired by the Mutants themselves when Vultureman fires the Shifter’s beams at the Eye of Thundera and it reverses the effects on all the affected ThunderCats. Malach’s decision to dump all the clichés and resolve the episode with a completely original notion brings a befitting end to a brilliant episode. The “samoflange” line heard in the now famous “ThunderCats Outtakes” originates from this episode. This is the first time that the ThunderKittens are shown to be engaged in separate activities instead of being together like they always are. 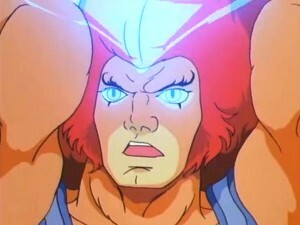 Lion-O displays an unbelievable feat of strength when he single-handedly lifts the ThunderTank. 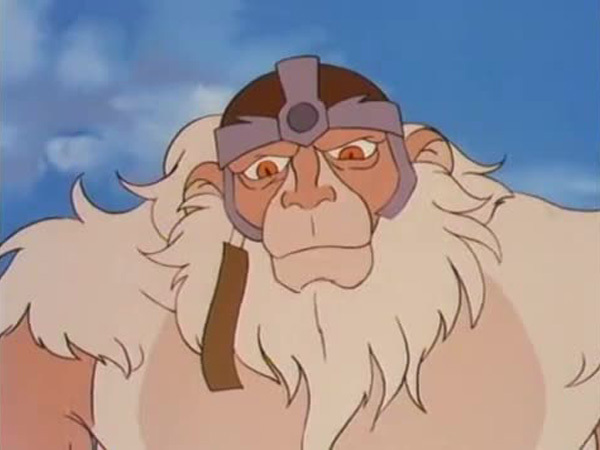 The fifth screencap below of Panthro in Snarf’s body is an obvious reference to Panthro from the introduction sequence.